COAL CITY, Ill. (WLS) -- Police are looking for the gunman involved in a shooting near a gas station in far southwest suburban Coal City. Officers responded to reports of shots fired near TD Pete's Shell gas station in the 700-block of East Division Street around 8:10 p.m. Wednesday. 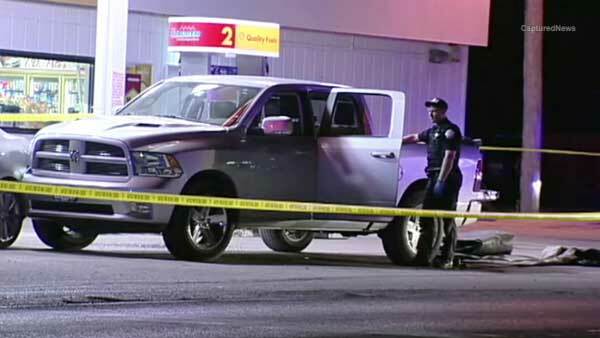 Callers said a man was bleeding inside his silver Dodge Ram. When police arrived, they found the man wounded inside the pickup truck. Investigators said the outside of the vehicle sustained damage "consistent with bullet damage." Eyewitnesses said after the man was shot, his truck crashed into another car at the gas station. The victim was transported to Morris Hospital, where he was listed in critical condition. He was then airlifted to Loyola University Medical Center. Police learned in their initial investigation that a male suspect left the scene before they arrived. The argument between that man and the victim occurred south of the gas station, police said. Many semi trucks park in that area. Coal City police called the shooting an isolated incident. No one is in custody. Officers are searching for the gunman.